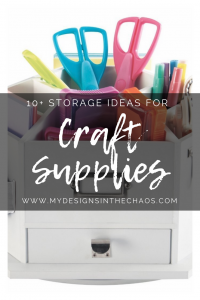 When you love to collect craft supplies, one thing that is a necessity is craft storage. 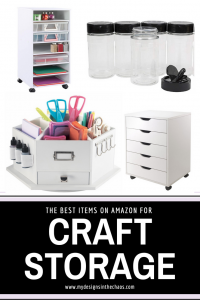 Today we have gathered all of our favorite Craft Storage Solutions from Amazon. First they will help get your space looking cute and tidy and will be on your doorstep in less than a week. So, let’s get to organizing!! This storage cart is so great for several reasons. It has wheels, it is open so you can easily access the items inside from all areas, and rose gold… need I say more? I like to use this cart as a project station. I can keep my supplies for my projects out but not really ‘out’ with this cart. That way I don’t forget what I was working on mid project. (Has that ever happened to you?…. 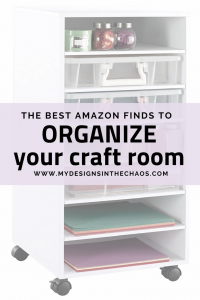 I like to call it crafter’s brain) It’s also especially nice if you don’t have a specific room for your craft space because then you can roll it around to where you are crafting and pack it up so things are out of the way when not in use. The next thing that I love for organization is drawers. Drawers immediately give the illusion that the room is more picked up than it really is. Also these are awesome because you can use your cutting machine to cut out the words of whatever you have inside…. scissors, paper, vinyl, etc. I absolutely love this little desk organizer. It is great to give those pens, tools, and extra little trinkets from your space a home. I’m always looking for ways to get my glitter under control. I have found these little spice jar holders to be amazing. They hold the glitter great and it adds some wonderful color to your room. Can you guess what this spice rack is for? You got it… glitter! The glitter spice jars above look so cute on a decorative wall rack. You could also fill this rack with paint. 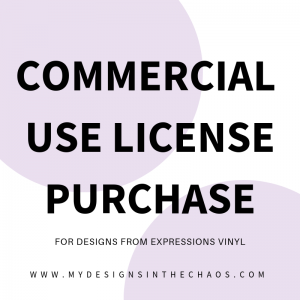 Both items would be perfect for organization and for decor. This storage container is also a desktop piece. Washi or ribbon would look so cute again for adding some color to your room. In addition to collecting vinyl I also love to collect paper. These drawers help me to organize the paper by color and pattern. It makes it super easy to find exactly what I am looking for when I’m looking for it. You can also add labels to the outside with vinyl which is another huge bonus. This little cart is a nice combo piece. You can stack fabric, vinyl, tools, or paper. It is super versitle and not too big and bulky. My final craft supply organizer from Amazon that I love is this spinning desk top. It has so many layers and looks great on a bookshelf. Do you have a favorite storage or organizer item for your craft supplies? We would love to hear about it! Also make sure to check out all check out our entire Amazon shop here to see not only our storage choices but also the supplies and tools themselves. Finally, while you are shopping on Amazon grab yourself a few crafting blanks too! Confused when we say crafting blank? We have decoded all the crafting terms here and we have put together a list of our favorite blanks on Amazon here. Plus, make sure to check out more of our organization tips and suggestions here. This post contains affiliate links which means that at no extra charge to you, we earn a small percentage when you shop through our links.